Over the weekend when Hillary Clinton was racking up lopsided wins in the Virgin Islands and Puerto Rico, moving her closer to wrapping up the Democratic Party’s presidential nomination, the Bernie Sanders campaign was warning the media not to preemptively declare Hillary Clinton the Democratic Party’s presumptive nominee. What, now Sanders wants to challenge First Amendment freedom of the press and tell the press what they can and cannot do, like Donald Trump? Trump’s un-American attack on the press . On Monday night, the Associated Press, and numerous other news outlets, declared that Hillary Clinton has enough pledged delegates and superdelegates to secure the Democratic Party nomination. AP count: Clinton has delegates to win Democratic nomination. Unbridled fury about the media and the Democratic establishment rippled through a crowd of Bernie Sanders supporters here Monday after reports that Hillary Clinton had clinched the Democratic presidential nomination. There were urgent calls for him to fight on to the Democratic National Convention in Philadelphia. And most of the dozen interviewed by The Washington Post were deeply bitter about news organizations, which they said had called the race too soon. The two chatted by telephone for about 45 minutes, with Sanders taking the call while he was on a highway between events in the Los Angeles area, according to a person familiar with the conversation who was granted anonymity to discuss it. Though the two have spoken from time to time in recent months, the timing of their latest call is another sign that leading Democrats are ready to wrap up the primary and form a united front against Donald Trump in the general election. Obama could endorse Clinton as early as Wednesday, White House aides say, but he has long signaled that he would take care to respect Sanders’ decision-making. Sen. Bernie Sanders plans to take stock of his presidential campaign at his home in Burlington, Vt., following Tuesday’s primary here and in five other states. “Let’s assess where we are after tomorrow before we make statements based on speculation,” the Vermont senator said Monday at a news conference here, when asked whether he is willing to endorse rival Hillary Clinton in the coming weeks. “We’ll be in L.A. tomorrow night and we’ll be taking a plane back to Burlington,” he added, when asked for further specifics on his schedule. But Sanders made clear that he is far from ready to cede the nomination to Clinton, who picked up more delegates over the weekend and leads the Vermont senator among both superdelegates and pledged delegates. “Certainly we’ll be campaigning in D.C.,” Sanders said, looking ahead to the District’s Democratic primary on June 14. Following the results in Puerto Rico, it is no longer possible for Sanders to reach the 2,383 needed to win the nomination based on the remaining available pledged delegates and uncommitted superdelegates. Indeed, Clinton’s victory is broadly decisive. She leads Sanders by more than 3 million cast votes, by 291 pledged delegates and by 523 superdelegates. She won 29 caucuses and primaries to his 21 victories. That’s a far bigger margin than Obama had in 2008, when he led Clinton by 131 pledged delegates and 105 superdelegates at the point he clinched the nomination. Having already secured the necessary 2,383 delegate commitments for the nomination, today’s contests — which are proportionally awarded — will only pad Clinton’s popular vote, primary win, and delegate leads. Nate Silver’s Primary forecasts at Five Thirty Eight projects Clinton has an 89% chance of winning the California primary, and greater than a 99% chance of winning the other delegate rich primary in New Jersey. Clinton is also favored to win in New Mexico. New Mexico Democratic Polls: Clinton Ahead of Sanders. Sanders’s statement — and the AP’s call — distract from the larger point. Clinton will be the Democratic nominee because substantially more Democrats have voted for her. In addition to her elected delegate majority, she’s received approximately 13.5 million votes so far in primaries and caucuses, compared with 10.5 million for Sanders. In fact, Clinton can still win an elected delegate majority provided that she wins just 215 of the remaining 714 pledged delegates available Tuesday and in the District of Columbia’s primary next week, or 30 percent. So it’s not just that Sanders can win only if a huge number of superdelegates flip their vote to him. He can win only if a huge number of superdelegates who have committed to Clinton flip their vote against her, despite her having won a clear majority of votes and elected delegates, thereby overturning the popular will. In the end, none of this will be enough to affect the outcome of the Democratic nomination, which has been fairly obvious since March. But Clinton needs support from Sanders voters or she could face a close call in the general election against Donald Trump. The Sanders campaign has had a galvanizing effect for many people, on social media and in real life. On Monday night, the Associated Press reported that Hillary Clinton had secured the Democratic nomination, according to its survey of superdelegates. The Sanders campaign said it’s not over yet. At a news conference in San Francisco earlier in the day on Monday, on the eve of the California primary, Mr. Sanders noted that his campaign has drawn the support of voters under the age of 45 “in overwhelming numbers.” But his supporters can do their own delegate math and understand the realities of the end of the road. The question they’re left with is: What now? In their own words, here is where Mr. Sanders’s legion of supporters plan to take the “political revolution” next. In conversations I had with more than a dozen Sanders supporters, many of them told me they were either disillusioned with or apathetic toward politics before this campaign. Mr. Sanders, a 74-year-old democratic socialist from Vermont, energized them unlike any candidate before. Now, depending on how the Democratic primary turns out, they’ll either resign themselves to voting for Hillary Clinton, redirect their efforts to local campaigns or drop out again. 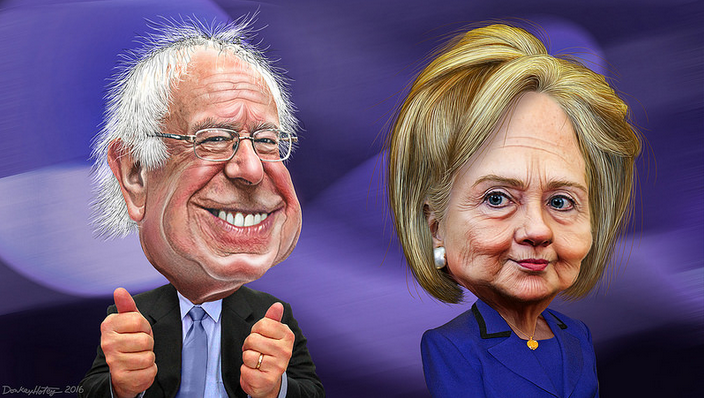 While a few die-hard Sanders supporters have vowed that it’s “Bernie or bust,” a Quinnipiac University poll from late May found that three-quarters of Sanders supporters would vote for Mrs. Clinton if it came down to a Donald Trump-Hillary Clinton race in November. Alex Sheehan, 29, an digital media entrepreneur in New York, said he thought that when faced with the prospect of a Trump presidency, most Sanders supporters would end up voting for Mrs. Clinton — and “If not, we deserve the catastrophic failure that follows,” he said. This month, after the primaries are all over, some Sanders supporters will try to answer the question of what’s next at an event called the People’s Summit in Chicago. The mission of this gathering: to figure out how to turn Mr. Sanders’s momentum into lasting change. One of the attendees will be a digital strategist named Winnie Wong. After working with the Occupy Wall Street movement, she helped start the grass-roots group People for Bernie, and has been credited with coining the hashtag #FeelTheBern. She said she saw a connection between the Occupy movement and the Sanders campaign. “This is a movement,” she said. “It is not about Bernie Sanders. He’s a part of this movement.” And, according to Mr. Sanders’s most ardent supporters, that movement isn’t going anywhere. Other Sanders supporters say they want to help get more Berniecrats into office. Michelle Coulombe, 28, is a student in Renton, Wash. She said that regardless of how the primary season ended, she hoped to work for other progressive candidates like Pramila Jayapal, who is running to represent the Seventh Congressional District in Washington. “Campaigns end, movements don’t,” Ms. Coulombe said. This is at least a positive, productive and welcomed use of Sanders supporters’ time and energies. Unlike this useless “protest vote” nonsense I keep seeing posted all too frequently at this blog. And I’ll bet he doesn’t vote for any down ballot candidates or work for their campaigns either. I find such selfish behavior inexcusable. Andrew Sullivan has correctly described Donald Trump as an “extinction-level event” for democracy, America Has Never Been So Ripe for Tyranny. Voting is serious business, and you had better take your vote seriously. Otherwise you may be an enabler of Trump tyranny. You don’t have the right to subject your fellow citizens to that dystopian future out of spite. I voted for Bernie in the primary. I don’t regret that based on what I knew at the time. Life is a series of compromises. Unless you are rich, that’s the only way you can afford to be perfect. As compromises go I’m actually pretty happy voting for Hillary in November. She is more progressive/liberal than people realize. Is she perfect? No one is, but she is a sincere capable hard-working woman who will carefully consider her decisions and do her best for the American people. And most importantly she will protect women, children, Social Security, the EPA, and most importantly she will nominate decent judges and Supreme Court justices. I am very excited to be able to witness this historic night. I don;t think its over. Have you heard of the October surprise? Well if you read some of these emails, and given that the FBI still has not finished the work, well, who knows? if its all over I better get my I am voting fora strong woman jill stein green party bumper sticker on my car. That’ll show em, capt AZ! Cast your vote for an attention grubber who has never been elected dog catcher! You purists never cease to amaze mw. If you want a saint, you had better hope Jesus comes back to run. No one including. Bernie, will ever live up to your expectations.